Description: In Benevolence, Washington, the Lamont family’s luscious handmade chocolates are a beloved tradition—and the sweetest of comforts. And for the most reserved of the three Lamont sisters, they’re a much-needed way to challenge the past, rekindle hope—and make happiness for a lifetime. Caring family and friends, tranquil streets—ex-prosecutor Willow Lamont wishes these could make her feel truly at home. She’s back to help her grandfather manage Chocolate Haven, a long-held dream come true. But she’s struggling to make their unique fudge—and to cope with a secret trauma that haunts her. Yet when she finds an abandoned baby who breaks her heart wide open, she wonders how long she can hide her emotions—especially from warm, handsome, and way too nosey Deputy Sheriff Jax Gordon. My take: Bittersweet is the story of Willow Lamont and Jax Gordon – two people who survived horrific events when they were young. Both dealt with their traumas in their own way and grew to be upstanding adults who only hoped to outrun their bad memories. When Willow returns to the small town where she grew up to help at her family’s chocolate shop she runs into Jax, a school friend from when they both lived in Benevolence. Neither has a problem with being friends but can they deal with what could happen if the underlying attraction they feel becomes more? Fate has plans of her own when a baby comes on the scene late one night. No spoilers here! This is the first of author Shirlee McCoy’s books I’ve had a chance to read. I thought it was a sweet and heart warming story about learning to trust and move forward. I’d definitely read another book by McCoy. Recommended to fans of the author and contemporary romance. Aspiring PI Jane Kelly likes to pretend she’s a bah-humbug kind of girl, but she’s had mistletoe on the brain ever since she shared a kiss with her boss, Dwayne. Before she can hope for a repeat performance, Jane must solve a kidnapping that’s as twisted as a candy cane—and not nearly as sweet. Veda Trent is back in Townsend to fill in as temporary manager of the Crafts Co-op, but she’s not planning to stay. Though the mountain town is small, it holds lots of unsettling memories. Yet the wind can change, bringing with it new opportunities—and the chance to create the kind of Christmas Veda has always longed for. My take: I think Christmas is the perfect time of year to read an anthology. 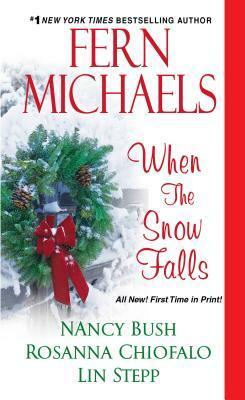 When the Snow Falls includes 4 very different stories. The first involves an attractive pair brought together by a bit of matchmaking on the part of a mutual friend who happens to own a 5 star ski resort in Colorado. There’s a mystery to be solved at the resort too. I liked this story. The second is more mystery than romance. I thought it was ok but that’s how I feel about most mysteries. The third was a heartfelt story about a woman wondering if she can go on in life after a huge loss. Can’t say much more because of the spoiler possibilities. Most of it takes place in Europe and there’s a small paranormal aspect. The last story picked up where a novel I read a few months ago left off. I didn’t expect that. I enjoyed going back to the small mountain town and the people who live there. A young woman wonders if she should find out if you can go home again. I hope the author continues this novella in a future full length novel. This was my favorite of the four stories. That said, When the Snow Falls has a little something for every reader. Synopsis: Sloane Russo’s turned a decade of crazy jobs and whimsical travel into a career writing steamy novels set in exotic places. Trouble is, Sloane’s flat broke now–and she can’t channel sun-drenched beaches in the Blue Ridge Mountains. The only fast cash in town comes with some seriously distracting temptation: Gavin Carmichael, hot, handsome and oh-so-hard-headed. My take: This is the third book in the Pine Mountain series and even though it’s the first of the series that I’ve read I didn’t feel lost in the setting or with the characters. It can definitely stand alone. I enjoyed Sloane and Gavin’s story except for a predictable part in the last third of the novel. It moved the plot so I get why it had to happen but still. I won’t spoil it for other readers. Could be it just bothers me and no one else 🙂 I liked the two characters and enjoyed Sloane trying to get the serious Gavin to loosen up a bit. In turn, Gavin encouraged Sloane to believe in herself and to trust her decisions. I think my favorite part of the novel was the relationship between Sloane and Gavin’s young sister Bree. Bree is learning to live without her mother (who died about a year earlier from cancer) and is in desperate need of a mother figure who understands her and can help with the things girls her age experience. It was handled well, I thought, and covered things I’ve not come across in any other romance novel. 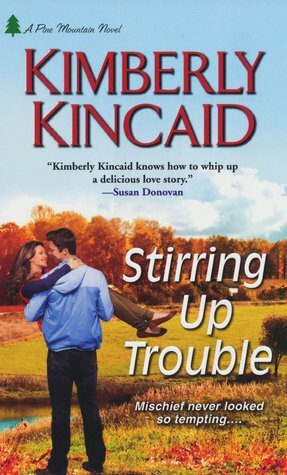 Stirring Up Trouble is the first book by Kimberly Kincaid I’ve read and I look forward to reading more. Recommended to fans of the Pine Mountain series and Contemporary Romance.